Since its establishment in 1946, the success of the Bradenton Yacht Club is a direct result of the dedication and caring of our Members and Founding Fathers. We are truly one of the friendliest clubs you will visit and our volunteer members and staff work hard every day so we can enjoy our very special place. Our objectives remain strong; we are a club that promotes boating safety and social activities for the enjoyment of boaters, and the preservation of the waters of Manatee County. 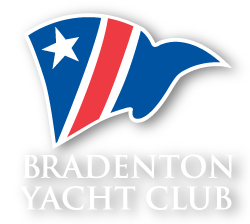 As one of the 13 original founding clubs in the Florida Council of Yacht Clubs the Bradenton Yacht Club has a reputation of being one of the friendliest clubs in the Council. Our membership is diverse, including boaters of various skill levels, backgrounds, ages and interests. The club has grown from 18 charter members in 1946 to about 600 families (1200 members). Many of our social activities are family oriented and most are casual in nature, although we are dutiful in maintaining our formal yachting traditions as well. BYC is located on Snead Island in Palmetto, FL. Our 6-acre campus on the Manatee River includes a marina, pool, tennis and boat storage facilities. Our clubhouse and poolside facilities provide fine dining opportunities, plus bar service, 6 days a week --- including lunch and Sunday breakfast. We invite you to visit us and share in the happy, rewarding memories that we are making at the BYC. The Bradenton Yacht Club was chartered and incorporated on May 11, 1946, with 18 charter members. BYC originally met at the Memorial Pier building in the city of Bradenton. By 1960, membership had increased to 63, and BYC rented a building on a small basin west of the Desoto Bridge to accommodate that growth. A few years later, BYC decided to look elsewhere for a home of its own. In 1966, a suitable property was located on the north side of the Manatee River. Construction of the original structure began in May, 1967, and the original building was completed in January, 1968. A BYC milestone was reached in 1971-1972 with membership topping 250, requiring the addition of a new kitchen, swimming pool, bathrooms and an office. Our Yacht Basin was completed and dedicated on May 22, 1976. Two tennis courts were added in 1985. Our ever popular Tiki Bar was built in 1987. On August 15, 1989, the BYC property was annexed into the City of Palmetto. Within two months, the membership voted to build our existing facility, a good move because membership had topped 500. With the new facilities completed, BYC began to offer full restaurant and bar service to our members and guests. To complement the new clubhouse, the pool area was expanded and renovated in 1993 creating an attractive connection between the club and the waterside Tiki area. We continued our outdoor improvements and added a storage building and workshop, enclosed the Dry Boat slips, added a Youth Sailing program, a fleet of four JY 15 sailboats, and improved the boat ramp launching facilities. BYC built a fuel dock offering full gasoline and diesel service that opened for business in 2001.